Costa Rica Honeymoon: Costa Rica has become one of the most popular places for exotic honeymoons. In this small tropical paradise you can find everything from secluded beaches to tropical jungle and accommodations that range from upscale resorts to distinctive nature lodges, perfect places to provide a most romantic way to start your new life and make this time unforgettable. Costa Rica is a paradise for honeymooners! The perfect combination between nature and relaxing beaches. Enjoy ten wonderful days visiting volcanoes, tropical forests and beaches, staying in beautiful hotels. After a delicious breakfast, you will pick a Daihatsu Bego 4x4 manual at your hotel and drive to Arenal Volcano, the Costa Rica’s most spectacular geological attraction. Overnight at Tabacon Hot Springs in a Honeymoon suite room perfect to your stay. A spectacular buffet breakfast will be waiting for you. Free morning to enjoy the area. We recommend you to enjoy the hot springs in the hotel. Overnight at Tabacon Resort and Spa. After breakfast, continue to Monteverde Cloud Forest, where you may spot birds such as the silvery-throated jay, spangled-checked tanager, black-thighed grosbeak, and the yellow-throated finch. Mammals such as peccaries, puma, and mountain deer also can be seen. Overnight at the lovely Fonda Vela Hotel. On the Hotel property, you will find lush forests and verdant pastures that are excellent for birding and hiking. We maintain over a kilometer of nature trails. In this tranquil setting, you can often see parrots and toucans that come to feed in the wild fruit trees. During certain months, the Fonda Vela is an excellent place to see Resplendent Quetzals and Three-wattled Bellbirds. Two kilometers away is the world famous, 10,500-hectare (26,000 acres) Monteverde Cloud Forest Reserve. We can help you choose and book the local tours and attractions most suitable to your desires. The Fonda Vela Hotel has nine buildings nestled in the beautifully landscaped property. Each is designed with natural lighting, privacy and warmth. All have large windows, with views of our forest, bringing the outside beauty into each luxurious, comfortable and cozy room. After an early morning breakfast, you will be taken to the Walkways; this is a unique system of suspension bridges that zigzag through deep canyons at the level of the treetops. Then, feel the adrenaline and enjoy the canopy tour, which consists of sliding on a cable between many platforms and different towers over the forest. Here you will experience the cloud forest from a nice perspective. Overnight at Fonda Vela Hotel. Enjoy breakfast, and free time to relax. Overnight at Flamingo Beach Resort. Breakfast, and free time to relax. We recommend you to visit the beaches around like Conchal and Tamarindo. Overnight at Flamingo Beach Resort. After breakfast departure to Heredia. Overnight at Finca Rosa Blanca. Breakfast. Drop off the vehicule in the rental car near to the airport office. Transfer to Juan Santamaria International Airport for your flight back home. Note: Rates are in US dollars and only valid for this quotation. For the rent of the car the guarantee deposit required is $750,00 with credit card. This package is for nature enthusiasts: Stay at some of the most beautiful hotels in exclusive locations. You will experience the splendor of Finca Rosa Blanca hotel, the Tortuguero National Park canals an extensive system of natural and man-made waterways, traveling through the canals is a fascinating experience rich in wildlife that includes monkeys, iguanas, and tropical birds, the hot springs of the majestic Arenal volcano, one of the most pristine beaches: Manuel Antonio beach, and the extraordinary biodiversity of Corcovado National Park, considered to be one of the most important natural preserves in the Americas. Arrive at International Airport where our driver will meet and transfer you to Finca Rosa Blanca Country Inn, located in Heredia. This is an elegant boutique hotel, which offers a romantic hillside vista with row upon row of coffee plants cascading down the slopes. Overnight at El Guarumo Room. “Luxuriate in the elegance of “El Guarumo”, a junior suite where you can sit on your private terrace or bask in a free form tub overlooking a Guarumo tree and the far-flung reaches of the valley below”. Ready for an astonishing look at Costa Rica's biodiversity? After a comfortable drive by Braulio Carrillo National Park, a protected primary forest, you will enjoy a Costa Rican breakfast in route. Board a comfortable boat upon arrival to the port and let this extraordinarily exotic paradise enchant you, as you travel along the Tortuguero Canals. In Tortuguero you might see toucans, brightly colored macaws or even some boisterous howler monkeys traipsing through the trees. With nearly 14 miles of coastline, Tortuguero National Park is one of the most important nesting sites for four varieties of marine turtles, including the massive Green Turtle, which can weigh over 400pounds. (From July to October).Enjoy a refreshing cocktail and a delicious lunch. After lunch, Explore with your naturalist guide the local attractions including the butterfly farm, frog farm and garden, frog point, aquarium, bio-digestor, and gardens. A delightful dinner will be served upon arrival back to the lodge in the evening. At night, relax at Mawamba Lodge in a superior room special for honeymooners. After a delicious breakfast, you will be taken a hike where you can admire the tropical rainforest. Lunch. In the afternoon you will have a canals boat tour. Overnight at Mawamba Lodge. After breakfast, boat and land transfer to Guápiles area. After lunch, you will be transferred to Arenal area, Costa Rica’s most spectacular geological attraction. Lunch. Overnight at Tabacon Resort, this hotel count with luxurious rooms, all finely furnished and with all the comforts that a hotel of this category provides, always surrounded by beautiful natural gardens and an impressive view of the Arenal Volcano. All hotel guests have unlimited access to the hot springs no additional charge. Breakfast. Free day to enjoy the hot springs, enjoy this natural wonder of Costa Rica and soothing feeling in any of mineral pools and naturally warm waterfalls. Overnight at Tabacon resort and spa. After breakfast, transfer from Arenal to Manuel Antonio National Park. Considered to be the most beautiful park in all of Costa Rica, with white sandy beaches, scenic walking trails, and lively monkeys. Free afternoon. Overnight at Parador Hotel , one of the best hotels in the area with a spectacular ocean and jungle view. Tastefully designed and decorated to meet the highest standards and most delicate needs, the hotel invites you to enjoy the beautiful scenery of Costa Rica's Pacific Coast, with world class accommodations and the highest quality service that you deserve. Breakfast, free day to enjoy the beach and the area. Overnight at Parador Hotel. After a delicious breakfast you will be transferred to Sierpe to take a boat to Drake Bay. Once you arrive, a driver of Águila de Osa Inn will be waiting to transfer you to the dock and you will enjoy a boat trip through Sierpe river and the Pacific Ocean to arrive to your lodge. Águila de Osa Inn is located in Costa Rica's Osa Peninsula, situated on a high bluff overlooking the Agujitas river with panoramic views of Drake Bay. Reaching out into the Pacific Ocean along the southwest coast, the Osa was once described by National Geographic as one of the most biologically intense places on earth. Encompassing Corcovado National Park and Caño Island, two of Costa Rica's most prized protected areas, the Osa Peninsula is a priceless natural treasure with an abundance of tropical plants, mammals, insects and over 350 species of birds. No other region of Costa Rica offers the visitor a more pristine, virgin environment to discover. The Águila de Osa Inn offers visitors to the region a comfortable and private refuge from which to explore the magic and beauty of mother nature in all her glory and complexity. Lunch. Free afternoon to enjoy the beautiful area. Dinner. Overnight in a Junior Suite, the package includes a bottle of Champagne , appetizers at the bar and wine with dinner and flowers in the room. After breakfast, tour to Corcovado National Park. Situated just 20-30 minutes by boat from Aguila de Osa Inn, Corcovado National Park is world renown for its rich diversity and spectacular scenery. Your Corcovado tour begins with a visit the San Pedrillo Ranger Station, which is the Park's northern most ranger station. From here your guide will lead you up into the dense jungle comprised of primary and secondary forest, during which time you'll be introduced to some of the more interesting aspects of the Park's natural surroundings. The trails themselves are clearly marked and easy to navigate, ascending and descending through the verdant rainforest. One particular trail leads to a large waterfall, ideal for photos and/or bathing. While hiking along the trails you'll find yourself crossing streams/rivers, in addition to traversing across slippery, sloping terrain. Sandals are not recommended for the hiking portion of the tour. This tour includes lunch and soft drinks, which are served at the end of the hikes. Shortly thereafter you'll board the boat and return to your lodge. Dinner. Overnight Águila de Osa Inn. Breakfast. Enjoy a visit to Caño island where you can do Snorkeling and Hiking in the trails. Lunch and dinner. Overnight Águila de Osa Inn. After a continental breakfast, you will be transferred by boat and mini van to Drake Bay airport in order to take a domestic flight to San José city. After your arrival our driver will transfer you to Heredia. Overnight Finca Rosa Blanca Country Inn. 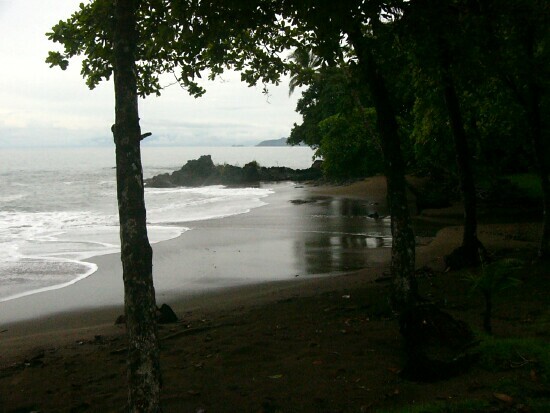 Transfer by Shuttle bus transportation from Guápiles ( Tortuguero connection) to Arenal Area, from Arenal Area to Manuel Antonio beach and from Manuel Antonio beach to Sierpe. Land and boat transfer from Sierpe to Aguila de Osa Inn (roundtrip). Private transfer from the airport (domestic flight) to your hotel. Rates in US dollars valid just for this quotation. A wonderful combination of volcanoes, nature and luxury accommodations. We have designed this honeymoon package to feature many of Costa Rica’s highlights such as cloud forest, active volcano with hot springs, and the beautiful Montezuma beach: imagine the beach just outside your bungalow, sumptuous breakfasts and exotic candle-lit dinners, monkeys in the trees and coatis roaming wild. Upon arrival at Juan Santamaría International airport, our driver will meet and transfer you to The Alta hotel. Overnight at The Alta hotel. If you are looking for a premium boutique hotel in San Jose, Costa Rica …. you are at the right place. Small, special, intimate, The Alta Hotel consists of only 23 units: 16 double rooms, 6 suites, and 1 Master suite. The beautifully sculpted hotel cascades down the hill (Alto de Las Palomas) providing exquisite views of San Jose and the surrounding volcanoes and valley. After a delicious breakfast, you will pick a Bego 4x4 car up at your hotel and drive to Arenal Volcano, the Costa Rica’s most spectacular geological attraction. The very active Arenal Volcano frequently emits sounds of violent explosions, attended by clouds of gray, brown, and orange gases. Overnight at Lost Iguana resort. The Lost Iguana Resort is a boutique hotel with 42 uniquely appointed rooms on 120 acres in a primal rainforest. All rooms have perfect views of the volcano. Enjoy trails through the jungle, a hot swim up bar & open air restaurant, plus a secluded spa with saunas, gymnasium and massage bungalows. The perfect romantic getaway, the luxury suite provides a restful haven after a long day of adventure. In addition to the amenities of the deluxe room, luxury suite also includes: dining area with refrigerator and coffee service, sitting Area, and jacuzzi Baths on deck with views of the Jungle and Volcano. A spectacular buffet breakfast will be waiting for you. Free day to enjoy the area. We recommend you to visit La Fortuna Waterfalls, the national park and lake. At night, visit to Tabacón hot springs, where you can sooth your muscles in the clear, relaxing thermal springs. Dinner included. Overnight at Lost Iguana Resort. Breakfast. In the morning, you will travel to Monteverde. Monteverde is the Costa Rica's premier cloud forest. This 26,000-acre reserve is home to an astonishing diversity of plant and animal species. Overnight at El Establo hotel. El Establo hotel, is one of the most luxurious hotels in Monteverde. 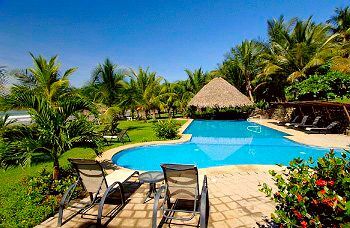 It is owned by a Quaker/Costa Rican family and it is located in Cerro Plano, this is a convenient place from where to start exploring the area. Monteverde Cloud forest is world famous for its beautiful landscapes and abundant flora and fauna. After breakfast, you will have a free day to enjoy the area. We recommend you to visit Monteverde Cloud Forest reserve. Overnight at El Establo hotel. Departure to Nicoya Gulf. Ypou have to take the ferry in Puntarenas dock to Paquera and continue to Montezuma beach. The Montezuma area has beautiful beaches that you can often find almost deserted and some waterfalls hikes. Candle lit dinner. Overnight at Ylang Ylang resort. Located on 20 acres of white sand beach and set in lush tropical gardens is this hidden gem. A secluded romantic getaway for travelers who want a casual resort and love the sounds of the ocean! Imagine the beach just outside your bungalow... Sumptuous breakfasts and exotic candle-lit dinners... monkeys in the trees and coatis, agoutis roaming wild. Breakfast. Free day to enjoy the beach. We recommend you to visit Mal País and Cabo Blanco beach. Candle lit dinner. Overnight at Ylang Ylang resort. Breakfast. Free day to enjoy the beach. Candle lit dinner. Overnight at Ylang Ylang resort. Breakfast, Free morning to enjoy the beach. At afternoon, departure to San José. Overnight at Alta Hotel. Cuando ingresa al formulario debe de especificar el numero de reservación #2017-806 y el monto a pagar de $574.00 equivalentes al 50% del total del paquete. En comentarios debe escribir que están de acuerdo con el cargo de $725 a su tarjeta de crédito. Una vez que recibimos el pago les enviaremos la factura y los vouchers correspondiente al cargo. Cualquier duda que se presente para realizar el pago, favor indicarnos para ayudarle!